Late last year I stumbled upon the Woking Amazing (vegan) foodtruck in Melbourne, and I’ve been obsessing over their Peking Duck Panacke ever since. I’ll be damned if a day goes by when I don’t crave a bite of their simple but satisfying savory pancake filled with cucumber, tofu and insane-in-the-membrane sauce. When I was visiting my family in New Zealand my granddad gave me a dusty old Chinese cookbook that was otherwise headed to the op shop. 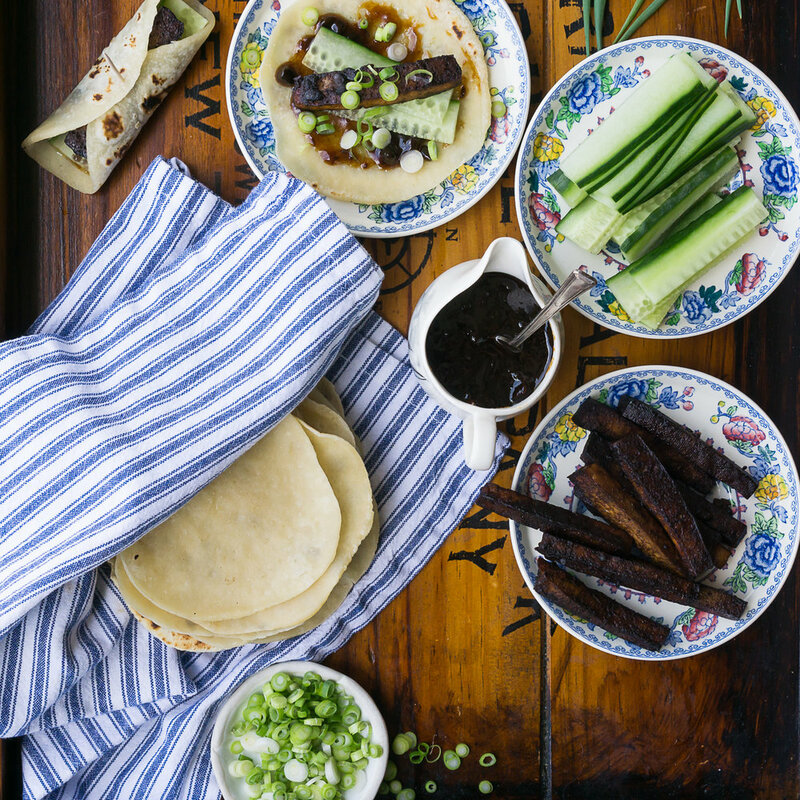 The first page I opened was for peking duck pancakes and to my utter joy, the sauce I’d been swooning over contained only a handful of ingredients, all of which my mum had in her cupboard. Fate. If you saw my last blog post, you’ll know that I’m in the throes of dealing with an incredibly picky two-year-old. Today he’s consumed three green smoothies (huge sigh of relief) and a piece of bread with peanut butter on it. Yesterday he only wanted cookies, and managed to get through an entire packet of digestives over the course of the day. The day before that it was an all day fast, followed by five pieces of peanut butter on bread (he wont eat it if it’s toasted or folded into a sandwich). In my quest to help Louie be more adventurous with food, I am focusing on super simple meals where there is at least one thing that I know he likes, and if possible, meals where he can be involved with the preparation to some degree. In this case, it’s the Mandarin pancakes, because rolling little balls of dough are a fun thing for little ones to get involved with. I also know that if it’s some variation of flour, water, salt and fat, Louie will eat it. By all means, make this with store bought roti instead of making the pancakes if you wish. As the roti is a lot bigger, you will only need 1-2 pieces per person. Likewise, you can skip making the sauce and use store bought hoisin sauce, just pick one that contains as few ingredients as possible. Admittedly it does feel weird to create, shoot and eat a meal that contains only one vegetable. Usually, any kind of pancakey wrappy thing that’s being built in my kitchen would contain at least some carrot, spinach, sprouts and definitely coriander, to go along with the cucumber. Do go ahead and make your pancakes this way if you feel so inclined. I wanted to stick with the traditional version, since I’ve become so enamoured with the super simple and delicious version I share here. Makes about 20 little pancakes which is enough to feed 3-4 people. Takes about half an hour. Place the vegetable oil in a small saucepan on a low heat. Add the bean sauce and stir for 2 minutes. Add the sugar and sesame oil and stir for a further 1.5 minutes. Allow to cool for 20-30minutes. Do this the night before if you have the time and energy. Drain and press and cut into desired shape. I do batons about ½ cm – 1cm in width. Combine the 2 Tbsp of Peking Sauce with the dark soy sauce and rice vinegar and stir until well combined. Place in the bottom of a shallow dish. 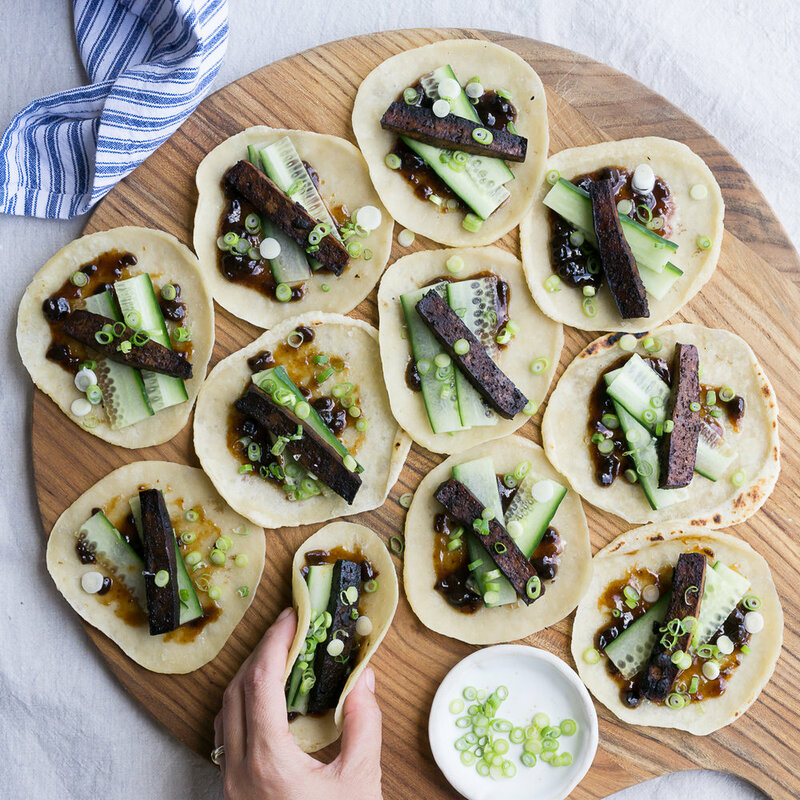 Add the tofu, piece by piece, coating evenly in marinade as you go. Cover and place in the fridge. Do this the night before too if you’ve made the peking sauce and still have the time and energy. When you’re ready to use the tofu, transfer to an oven proof tray and cook at 180°C for 20 minutes while you prepare the pancakes. Sift the flour into a mixing bowl. Gradually add the boiling water and vegetable oil, stirring all the time to make a firm dough. You need to be careful not to burn your hands here as the boiling water will make the dough very hot. If cooking the pancakes with kids, this is definitely a step for the adults. If it’s too hot for you to handle, just set it aside for a moment until it’s cool enough for you to touch. Break the dough into two pieces and roll each piece into a roll about 5cm in diameter. Cut into 1cm slices and form each piece into a small ball. Flatten each ball between the palms of your hands. Brush one side of each pancake with sesame seed oil and then sandwich the pancakes together in pairs, sesame seed oil on the inside. Roll the little sandwich into a pancake about 10-13cm in diameter. Heat a dry frying pan over a moderate heat. When it is very hot, fry the sandwiches one at a time, turning as soon as air bubbles appear on the surface. Cook the other side for 1-2 minutes or until little brown spots appear underneath. Remove from the pan and set aside while you get the next pancake ready. Once the next pancake is in the pan, the one you just cooked should be cool enough to touch. Very gently peel the two layers apart. Place on a plate and cover with a clean tea towel.